Peter Speake-Marin's love for the tourbillon is well known. 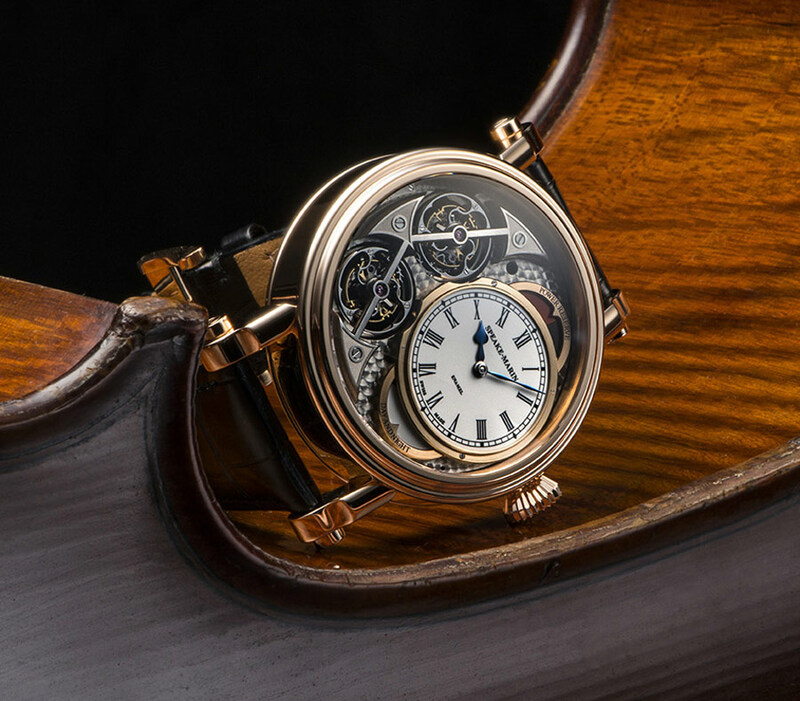 The first timepiece ever to bear his name was the Foundation Watch, a hand-made pocket watch equipped with a tourbillon escapement. 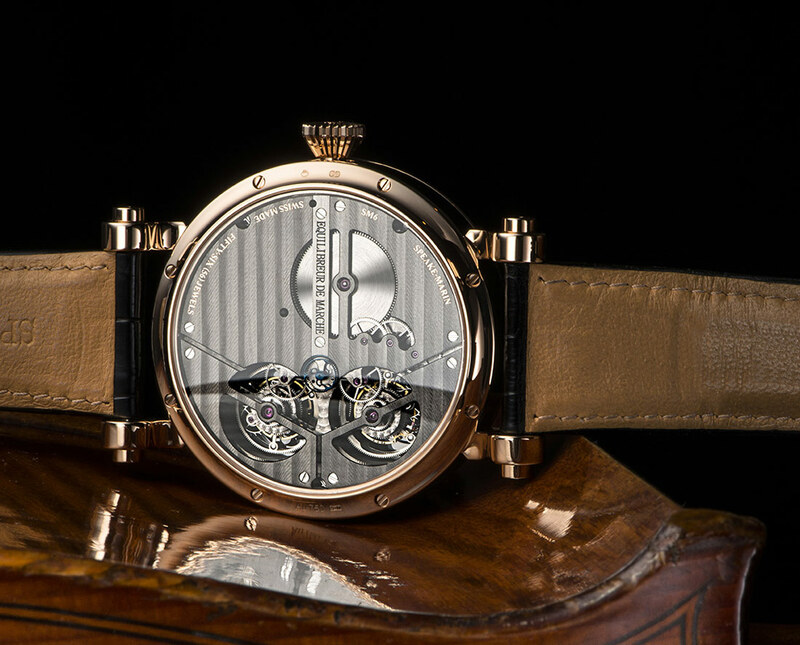 The name of his latest creation, Magister Vertical Double Tourbillon, clearly highlights the distinctive features of the model: two 60-second tourbillons linked by a limited-slip spring clutch and configured vertically. 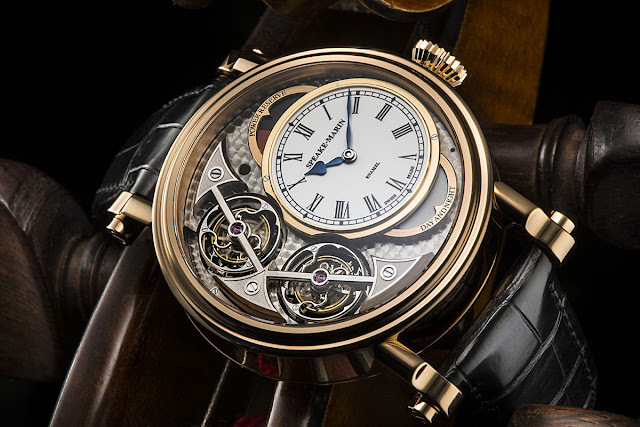 The two tourbillons are cleverly positioned on the left allowing the wearer to easily read time from the edge of a shirt cuff while the tourbillons remain discreetly concealed. Both tourbillons are supported by a single massive bridge, hand finished with mirror polished internal bevels. 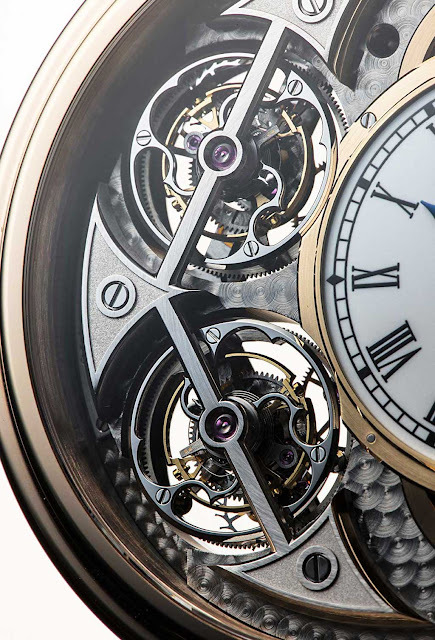 Each tourbillon has its own independent gear train powered by its own mainspring barrel. The two barrels are wound simultaneously via the crown. 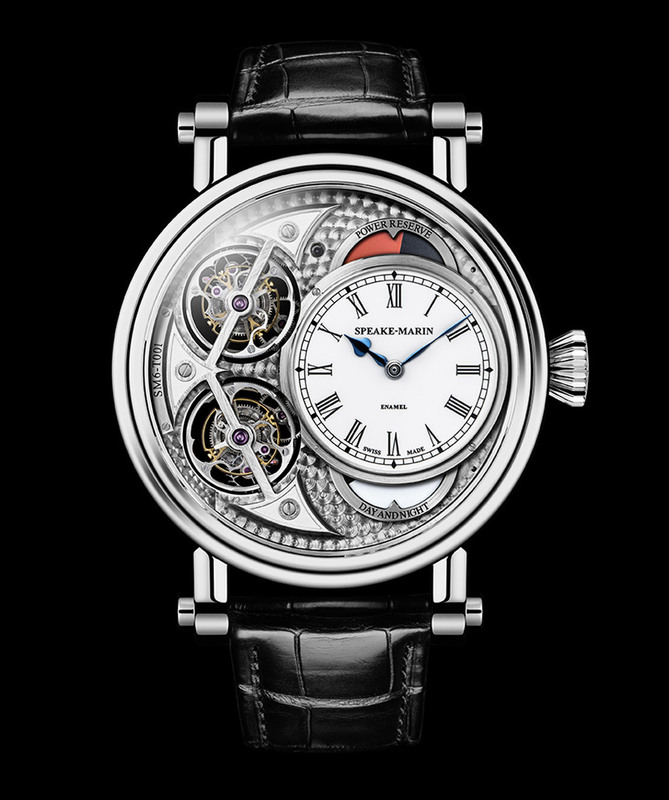 Through the case back it is possible to see the underside of the two tourbillons and a small wheel between their openings. This is the "Equilibreur de Marche" (rate equalizer) which takes the rate of the two independent regulators and transmits the average of their two rates to the time display. The typical blued-steel hands indicates hours and minutes in the large oven-fired enamel subdial. Just above it, a power reserve indicator displays the available power by means of a cam-shaped disc that opens when fully wound to reveal the gears and mechanisms below, and gradually closes and signals empty when a red section of the disc reaches the central marker. A day/night indicator under the subdial visually balances the power reserve indicator. The hand-wound Calibre SM6 beats at 21,600 vibrations per hour and guarantees 72 hours of power reserve. Finishes include German silver bridges, perlage and ruthenium plating and unusual Geneva stripes covering the 3/4 plate movement in two directions, away from the centre of the plate. The Piccadilly case has a diameter of 46 mm, a size that was chosen in order to offer a a legible time display while leaving enough room for the tourbillons to be fully enjoyed by the lucky owner.